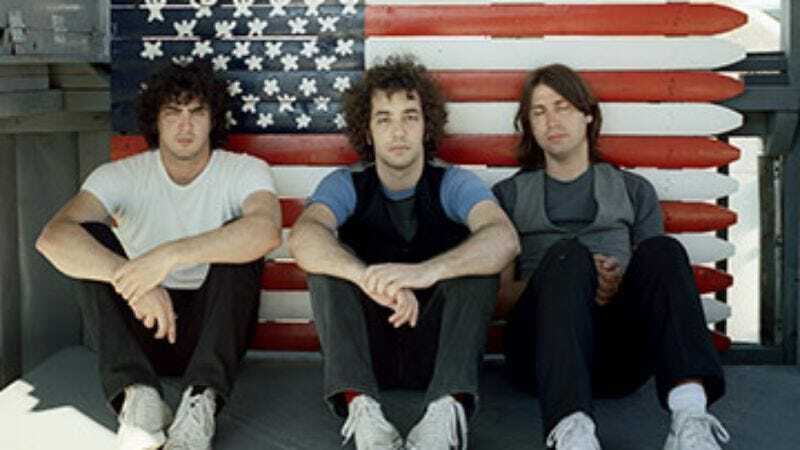 The shuffler: Albert Hammond Jr., guitarist for The Strokes and newly minted solo artist. Hammond is currently touring in support of his fine guitar-pop solo debut, Yours To Keep. John Lennon, "Whatever Gets You Through The Night"
Albert Hammond Jr.: This is from Anthology. If you bought Anthology, you've got to be a big John Lennon fan. This version is when he first took the song from the demo to the studio. The demo is just him and his guitar, and it's amazing. The A.V. Club: Is this version pre-Elton John? AH: [Listens.] No, I can hear Elton John on the harmony, but this is before they'd really worked everything out. It's funny, this song's got really great lyrics, but you almost don't hear them on the single version, because the production and arrangement is so "fun, party time, disco," you know? Pink Floyd, "Another Brick In The Wall (Part 2)"
AH: What year did The Wall come out? 1979? 1980? I was just born. But I remember when I first moved to New York and met [Strokes bandmates] Julian [Casablancas] and Nikolai [Fraiture], they came over to my apartment and we got really stoned and watched The Wall. I thought it was amazing. It was the first time I saw it. I guess I was 18. AVC: Even though the movie and the album were popular before you were born, they still had an effect on you? AH: Well, that's the thing about playing music. We always think, "Oh, it would be so nice to write songs that end up being timeless." Look at Buddy Holly. It's been, what, 50 years? And he's still, like, intriguing. Tom Petty, "It's Good To Be King"
AH: All right! Some really quite amazing songs coming up on random here. What a great-sounding record Wildflowers is. That's one of my favorites, not even so much for the songs, but the sound of everything. Really great acoustic-guitar sounds. AVC: Do you have any good Tom Petty anecdotes from when The Strokes toured with him last summer? AH: No. He comes in, plays his show. His band's really nice. I met him, but I was in such awe that I couldn't say much. Just like, "Hey." [Laughs.] "See you later, I can't think of anything to say." AH: [Laughs.] I got to hang out with him a lot and become sort of a friend. Just a really funny, awesome guy. AVC: He had such a distinctive stage persona, but was he different offstage? AH: A little bit. When you do anything onstage, you have a persona, so of course it's going to be different. But he was still a funny person. Just toned down. He was a really good person to hang out with and have a drink. Just very… easy, you know? Even though I admired him and enjoyed his stuff, it was really easy to sit down and talk to him and have fun. AH: From the White Pepper album. AVC: Do you take Ween straight, or as a joke? AH: Huh. Interesting. [Pause.] I guess I never really take it either way. Some of their songs are just really good songs. I don't know if the lyrics are joking or not, but if they are, they're just good songs that are funny. Like on The Mollusk or on Chocolate & Cheese, there are just a lot of amazing tones that they get. I mean, it's really cool that you can hear certain songs like "Buenas Tardes Amigo," and it's funny and you just listen to the story. And then you hear "A Tear For Eddie" and it's like… so pretty. And even "Voodoo Lady" is just fun. Even if it's a joke, it's a really well-structured, good-sounding song. They seem like they really know a lot about music. I'm cool with them doing whatever they want to. Making a weird disco song, whatever. A really weird country song. They're talented musicians. Willie Nelson, "There'll Be No Teardrops Tonight"
AH: I like Willie Nelson, but I wouldn't say that I'm a big country-music fan. It depends. I wouldn't not listen to something because it was country. I usually listen to stuff that friends give me, if I admire their taste. Expands your palette, you know? Ramones, "Howling At The Moon"
AH: What a great voice. AVC: Do you think of yourself as part of the continuum of New York punk and rock, from Ramones to The Strokes? AH: No. Not one tiny little bit. If anything, I feel more connected to The Velvet Underground. I don't know, there's just something about VU that gets to me more. Guided By Voices, "Club Molluska"
AH: This is the first song on Watch Me Jumpstart, which is an awesome documentary. This song is originally from Same Place The Fly Got Smashed. Guided By Voices are like my Beatles, I guess. They're what I grew up with, and what I wanted to be. The first Guided By Voices album I bought was Vampire On Titus, and the first song I heard from it was a Tobin Sprout song, "Donkey School." I remember putting it on repeat. I couldn't believe the sound. That song started with this, like, angry riff, and then it becomes the sweetest song. I was like, "Who are these guys?"